I have been playing around with handcut dovetails lately. 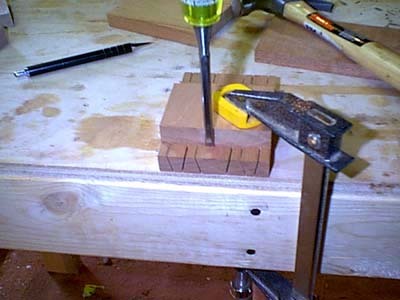 I wanted to learn an easy way to make them without the expense of the router jigs on the market. This is a jig I came up with while working towards this goal. 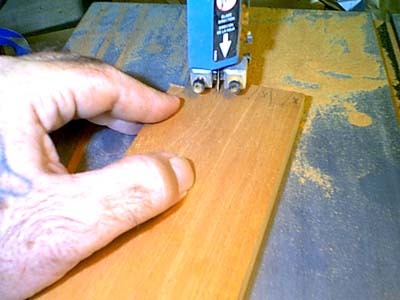 This jig is only used to cut the pins, but because it cuts them equally from each side, it makes them symetrical. The key is in the wedge that sits in the sled. This wedge is not attached, it just lays against the side. This way it can be flipped to cut an equal, but opposite angle. Dont ask what angle I used to cut the wedge. I just tilted the bandsaw till the blade was lined up from corner to corner on the wood and just started cutting. 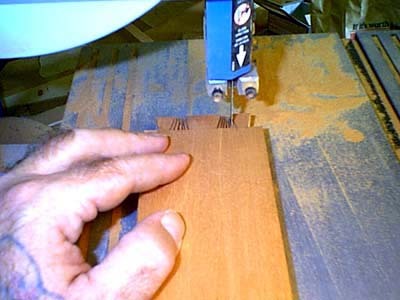 Afterwards, I ran the wedge through the jointer to get a smooth surface. 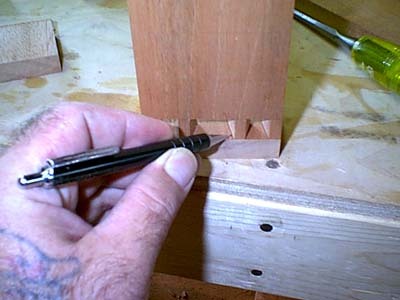 I am sure you can set an angle if you wanted a particular angle to your dovetails. I didnt think it was that important. 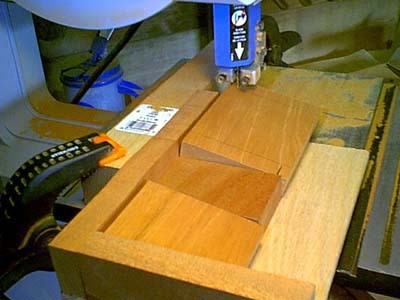 Here is the jig being used to cut the tails on the bandsaw. I have a fence set up to keep it the correct distance away from the edge. Once the first cut is made, the workpiece is rotated 180° to make the same cut on the opposite corner. As you can see I use a few pieces of wood as spacers behind the workpiece so the end of the workpiece is sticking out the front of the jig. This is done to keep the jig from being cut up. After the first couple of cuts in the jig, I realized this was a better way to go. Here is the jig from the other end. Notice the pencil lines on the workpiece. They are there to show where to stop the cut. Because I have not used a stop, I had to be careful not to overcut the workpiece. the wedge is flipped over and the workpiece is flipped over. 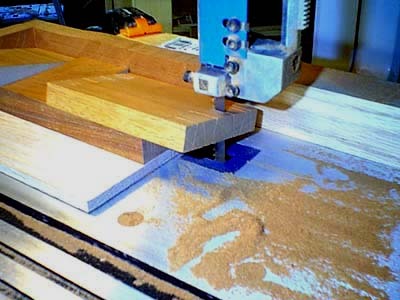 Then the bandsaw fence is moved further away from the blade. This allows the blade to cut the opposite angle on the pins. This is done until all the cuts are made. Next comes the manual work. First, I score the one side with the chisel so when I cut through from the other side, I get a clean cut without chipout. Then I flip the piece and start scoring and chipping until the waste pieces are removed. Be very careful not to remove the wrong parts of the pins. 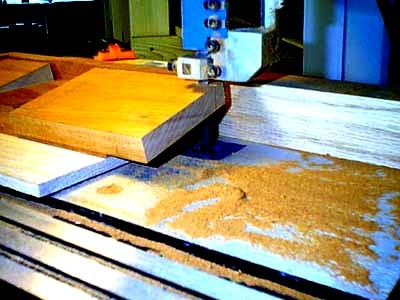 I use a straight edge piece of wood Clamped above the workpiece right on the line. This is so I get a straight line on the bottom of the pins. Rotate the piece and cut the other side. Then, start on the tails. First I place the pins end-down on the workpiece. Then, I sketch out the tails using the pins as a guide. It is important that the pins are at the very edge and lined up perfectly while the tails are drawn. Also, make sure the pins are facing the right direction. 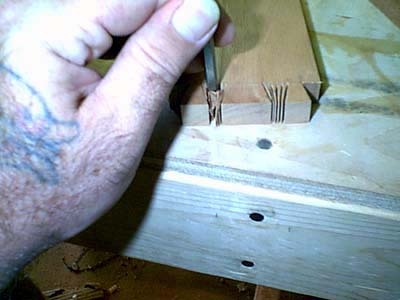 If you dont, your dovetails will end up backwards and not hold. Next I take the workpiece to the bandsaw and cut the tails out by hand. I try to cut with the blade running through half of the line. 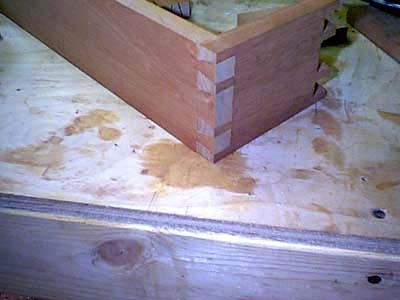 I find that if I take out half the line, I get good fitting dovetails. Notice the pencil marks on the workpiece. I have made a mistake before and cut out the wrong parts. Now I make cuts into the waste sections so they are easier to remove. Trying to remove the waste sections without doing this is very hard to do without messing up the tails. I then take the workpiece back to the bench and chisel out the waste. 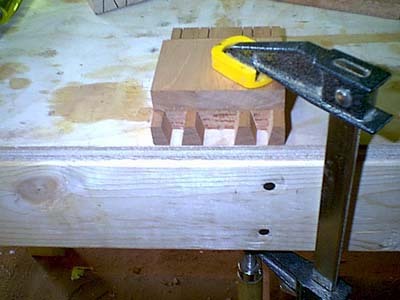 I am careful not to mess up the dovetails or the sholder of the dovetails. Finally the dovetails and pins are joined. Sometimes the dovetails dont come together perfect. 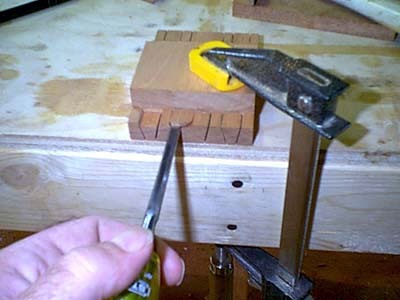 When this happens, I use a rasp to carefully file down the tails till I get a good fit. I found that this works for me. 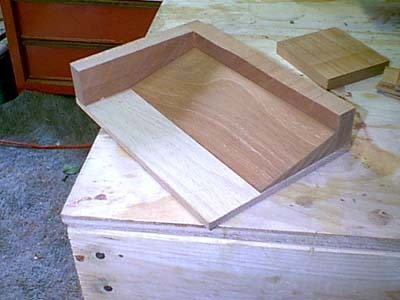 If you are looking for a way to make dovetails without the expense of a router based dovetail jig, this may just be an alturnative. If not, then I hope you got some enjoyment out of reading this.